The humble grace of this covered porch belies the complexity of the wooden joinery used to craft the roof. 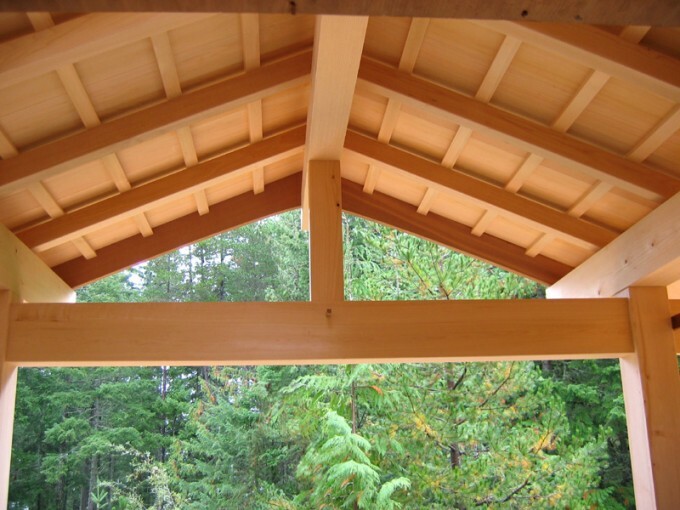 Japanese timber framing has a centuries old tradition of intricate joinery and precision finishing details. Tim helped build this porch roof at a Japanese timber framing course, learning from and working alongside renowned Japanese woodworker Dale Brotherton and natural building pioneer Robert Laporte. Inspired by the elegant architecture and precision craftsmanship of Japanese timber buildings, Tim was excited to increase his knowledge and further hone his skills in the beautiful setting of Salt Spring Island.